The folk music tradition in Wales is among the richest in the world; centuries old, it is as vibrant today as it has ever been. This collection highlights the best of the current folk scene from ‘the land of song’. 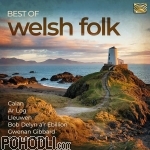 Including Calan, Ar Log, Lleuwen, Bob Delyn a’r Ebillion, Gwenan Gibbard, Gwyneth Glyn and more. Stránka vygenerována 19.4.2019 v 11:44:44 za 0.188 sekund.